This lemon marmalade is made with thin slices of lemon suspended in a bright and fruity yet slightly tart jelly. The two marvelous flavours of lavender and hyssop blend in perfect harmony to add an herbal note. Cooking summer jam is accomplished early morning when the kitchen has had time to cool down over night time..
Have you had a look at “Small Batch Magazine‘? You will find profiles of master artisans and learn methods for the creatively curious to try their own hand at making something great. And you can Read About Le Meadow’s Pantry in small batch magazine… I am also contributing to small batch magazine and will introduce master artisans from British-Columbia! Posted in Farmer's Markets, Jam, marmaladeTagged blueberry, farmer's market, jam, marmalade, small batch magazine, small batches, vancouver, VFM, whistler, yaletown1 CommentEditLimited Edition…Sour Cherry & Rhubarb JamPosted on June 18, 2014Année de cerises rouges met le rire sur toutes les bouches. Most of you know by now how much I cherish dandelion flowers.. Collecting them just before they change from suns into moons..
Dandelion confit is as bright as the sun and as sweet as honey.. it is simply spring in a jar..
Posted in UncategorizedTagged dandelion, farmer's market, preserves, small batches, spring4 CommentsEditPetit DéjeunerPosted on May 23, 2014“Oh lovers! Be careful in those dangerous first days! Once you’ve brought breakfast in bed you’ll have to bring it forever, unless you want to be accused of lovelessness and betrayal.” – Milan Kundera, The Book of Laughter and Forgetting. 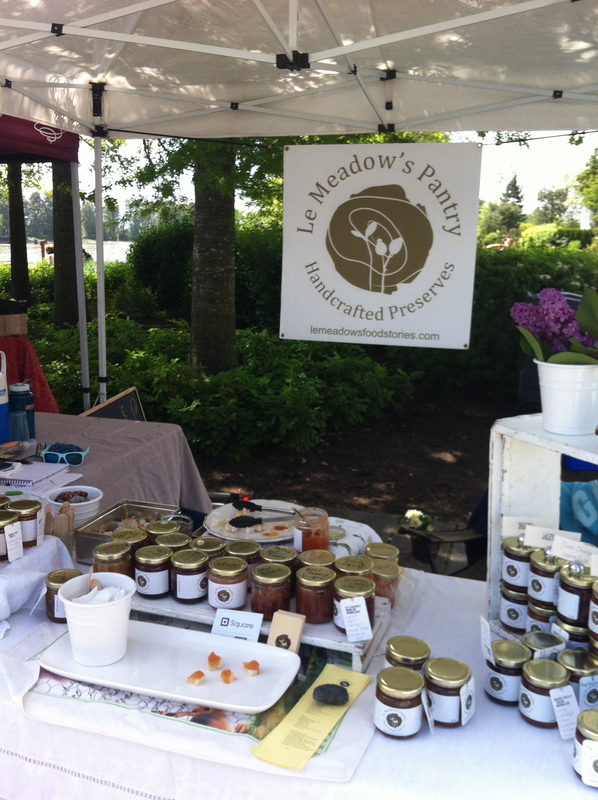 Wishing you a lovely week end..You can find us and some balsamic strawberry jam, rhubarb jam and dandelion confit at White Rock Farmer’s Market on Sunday, 9am until 1 pm. Last week end we attended our first market at the River District Farmer’s Market..
We had a lovely day under the trees meeting the resident of the river district. We will see you soon again. Happy Mother’s Day !Bonne Fête Des Mères !